The two tapestries in the Great Hall of Firle Place are French and date from the late-seventeenth to early-eighteenth century. 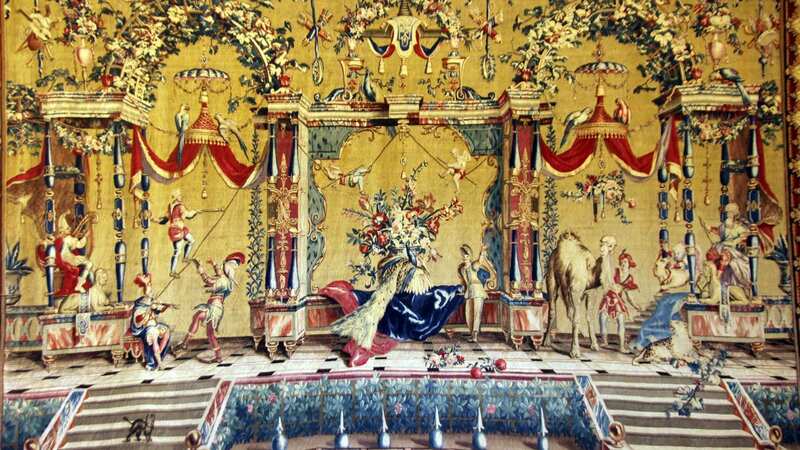 They were woven in wool and silk at the royal tapestry manufactory in the town of Beauvais. Closely similar, the two portray slight variations of the same composition which features a tripartite arcade where musicians, acrobats, and actors engage with exotic creatures. The animal prominent at the far right gives the composition its name, “The Camel.” The entire figural field is set against a warm, golden background. Garlands of flowers, swags of drapery and tassels, and trophies of crossed quivers adorn its upper stretches while, below, steps from the tiled terrace lead down to the edge of a foreground parterre. The borders are narrow with stylized, flattened acanthus leaves and clasps alternating against a red ground. The last four letters of the town’s name, [BEAU]VAIS, are woven in the outer-most blue edge of one tapestry border. These two weavings were part of a hugely popular tapestry series, called the Grotesques, that was produced at the Beauvais manufactory from 1688 to 1732 after the designs of Jean-Baptiste Monnoyer, the still-life painter who was born in Lille in 1636 and who died in London in 1699. Though little known today, he was well connected during his life-time, having been accepted into the French Academy of Painting and Sculpture in 1665. Louis XIV, king of France from 1643 to 1715, admired and collected his flower paintings. Monnoyer worked under Charles Le Brun (1619-1690), first painter to the king, on many projects for the French crown and at the royal tapestry and furniture manufactory at the Gobelins, before moving to England where contributed to the interior decoration at Hampton Court Palace and Kensington Palace as well as Montagu House in London. The whimsical subject of “The Camel” derives from contemporary late-seventeenth-century Parisian theater and street fair entertainments. Indeed, the figural groupings seem to represent a medley of performances as in a modern-day musical review: at left, three musicians (a harpist, a violinist, and a dancing tambourine player) give accompaniment to a tight-rope walker; at center, a master-of-ceremonies dressed as the commedia dell’arte character, Flautin, gestures upwards to a pair of aerial acrobats who balance above a large floral arrangement and a regal peacock; and at right, a turbaned patriarch presides over an animal act involving the fore-mentioned camel, a roaring lion, and a snarling leopard. The stage-like atmosphere is enhanced by the shallow depth-of-field and by the proscenium-like arcade. “The Camel” was one of multiple compositions available in the Grotesques series. The other subjects likewise referenced contemporary preforming arts, especially French court opera-ballet and Parisian comedy-ballet. Modern scholarship has given the following titles to the series’ six chief subjects: “Musicians and Dancers,” “The Offering to Bacchus,” “The Offering to Pan,” “The Elephant,” and “The Animal Combat.” In addition to theater, Monnoyer took inspiration from several disparate visual and literary sources, borrowing figures and forms from Antique, Renaissance, and Baroque precedents. Ultimately, the over-arching style of this series derived from ancient Roman wall fresco decoration, such as revealed by the 1480s excavations of the Golden House (or Domus Aurea) of the Emperor Nero (reigned 54-68). A significant factor contributing to the success of the Grotesques tapestries series was the flexibility of the individual compositions that could be customized according to the specifications of the patron. The looms at Beauvais could be set up to weave expanded or contracted, wider or narrower, taller or shorter versions without compromising the integrity or meaning of Monnoyer’s narrative scenes. Whether to accommodate dimensional requirements or to emphasize thematic preferences, component elements and motifs could be repeated, omitted, or re-arranged in order to create the desired outcome. As the two tapestries at Firle Place exemplify, the same composition could be subtly varied by differing details such as the small black dog that appears on the lower-left steps in one weaving or by the profusion of additional pink roses that peak through the lower trellis in the other. Correspondence, dating from 1695, remarked on this flexibility in the designs of the Grotesques tapestries and even stated that existing weavings could be cut into two or three vertical sections, and the borders re-applied, without damaging the overall concept. Another factor contributing to the success of the Grotesques series was its pleasing palette of the halcyon golden ground, luminous costumes, verdant greenery, and naturalistically-colored flowers and fruit. The hangings must have brought a literal and a metaphoric warmth to any interior on a cold and gloomy winter’s day. This quality perhaps explains the broad geographical appeal of those tapestries shipped outside France, to patrons as far away as Sweden, Denmark, Saxony, and Savoy. In total, the Beauvais manufactory produced an estimated run of some three hundred Grotesques hangings, of which about one hundred and fifty survive today, principally in museum collections. In 1931, these two tapestries were a wedding gift to the 6th Viscount Gage and his wife Imogen Grenfell from her parents, Lord William and Lady Ettie Desborough.